The Familiar Update, which lets players capture beasts for their armies. 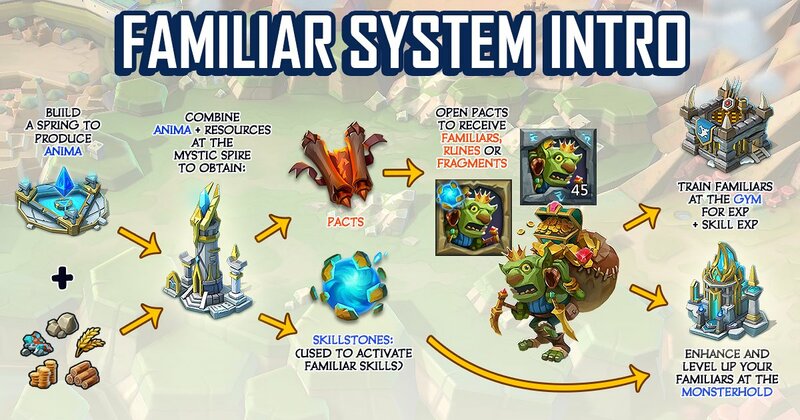 There are some thoughts (written by laststandb on Lords Mobile Reddit) on familiars. The main thing that will limit your development for familiars is runes. Most good skills are locked behind stages, and you need runes to advance each stage. In order to get past each stage, you will need to open hundreds of pacts. So even to unlock the most basic skill of a monster, it will require hundreds of hours and millions of resources. I believe Aquiris, from Pact 1B is the best familiar. At max strength, it gives on average 180 STA a day, which is worth 3k gems a day, way better than the gemming goblin. In addition, since it is an easy Pact, you will open your pacts faster and require a fraction of the RSS. Certainly, if you already have multiple F2P heroes gold and don’t really need STA you should skip Pact 1B. ). So with about 10 days of opening pacts, you can start getting extra STA every day. A pretty good deal. For people targeting Aquiris, your optimal turf layout will need to start with Two Mystic Spires. This way you can at least 8 Pacts Merged at once, so you can sleep/work and still be merging pacts without interruption. Leave one Spire at level 13 (to unlock 4 pacts), and once your ‘main spire’ is 25 and you can merge 9 pacts at once you should consider destroying your lvl 13 spire and replacing it with a spring. If you are aiming for Aquiris, do not buy any familiar packs or gem any familiar stuff. The $5 Amima Aplenty Pack will get you 2 days further along your Aquarius development. On the other hand, the $5 braveheart pack will give you 720 STA, which is worth at least 4 days of Aquarius skill usage. After Aquiris. You should skip directly to Pact 3 and Pact 4. Pact 3, in general, has a lot of good passives and skills for building up and improving your account. Pact 4 is very powerful, but it has a significant RSS and time cost associated with it. It is very important for rally leaders as the Mecha Trojan ability is crazy good. Lastly, it is not worth rushing Grim Reaper even though Grim Reaper directly kills troops. Grim Reaper has a prohibitive cost to using the skill, it costs 24 Chaos Cores to use the skill once, with each chaos core costing 7500 gems it is a minimum of 180k gems to use the skills once. Even top-tier players will be saving their Chaos Cores for the Mecha Trojan skill.